Zero Waste Teeth: Are Bamboo Toothbrushes Best? It’s annoying throwing away a whole toothbrush, so what is the alternative? There are several products on the market that claim to be environmentally friendly. Reusable toothbrushes with replaceable heads. Source make theirs from recycled materials, or Yaweco make theirs with solar power and are cheaper. This is what I use, and it’s great. Both of these are available in health food stores or online. Toothbrushes made from recycled yoghurt pots which can be recycled when you’ve finished with them. a) they don’t comply with the first rule of sustainability, which is to reduce. 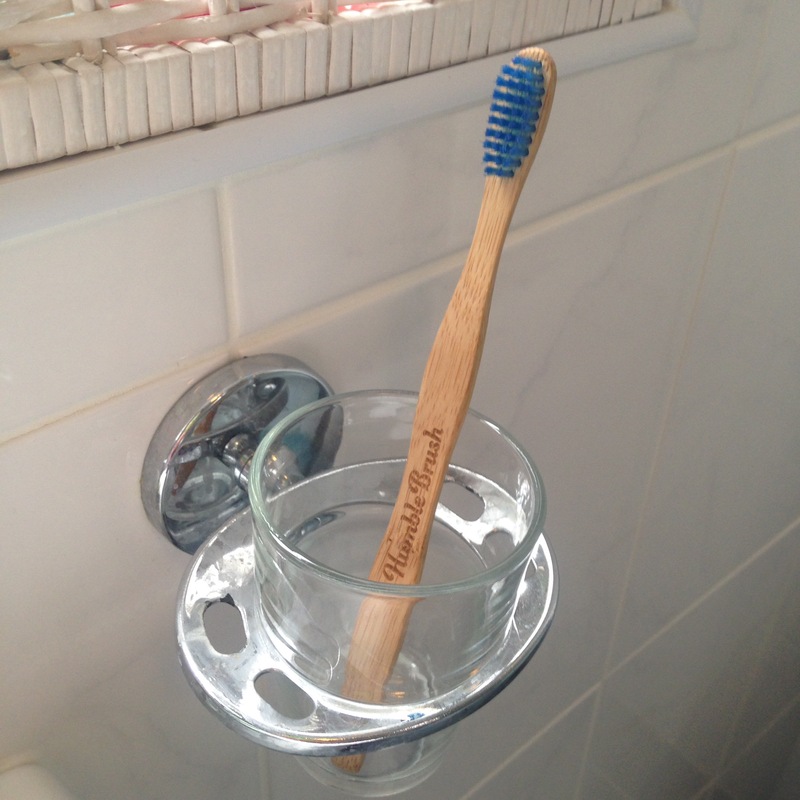 Bamboo toothbrushes are not designed to last – you have to keep buying and disposing of them. They will therefore need to be produced and shipped over and over again, with all the associated environmental impacts of that. b) there is not enough information available about the way the bamboo is grown to be sure it is sustainable. How do we know that forests are not being cleared to meet the growing demand for bamboo products? How does growing large quantities of bamboo impact biodiversity and food production? There are many questions that would need to be answered before we could conclude that bamboo is sustainable. c) if biodegradable toothbrushes end up in landfill, they will give off greenhouse gases for years. d) bamboo toothbrushes need extra equipment to be used – ie pliers to remove the bristles when you have finished with them. If you already have some about the place, then fine, but if you need to buy extra things for the sole purpose of disposing of bamboo toothbrushes, then this will add to the impact. e) they are more expensive than buying replacement heads for the reusable toothbrush. I can’t be 100% certain about this, because, although I’ve searched around, I haven’t found any research comparing the impacts of different toothbrushes. If anyone knows of any lifecycle assessments on this, please do write in. Otherwise, I’m offering my best guess. a) I am not convinced that these are good for your teeth – my dentist warns against brushing your teeth every day with bicarb, or using toothpastes that don’t contain fluoride. b) it’s not clear that these products are necessarily better for the environment. How is a jar more sustainable than a toothpaste tube? Glass jars can be very CO2 intensive. And what about the impact of the ingredients? Toothpaste in jars are often based on coconut oil, which is not super-friendly to the environment. Denttabs, which are teeth cleaning tablets that are crushed between your teeth. The main advantage I can see with these are that they significantly reduce resource consumption, as they are concentrate. They also contain fluoride. Apart from that, I can’t comment on how good they are for your teeth. One to discuss with your dentist. You may want to check out Kingfisher Toothpaste, as this received a high score on the Ethical Consumer Guide and is approved by the British Dental Health Foundation. First, is it worth bothering about such a tiddly piece of waste? Some people worry about animals or birds being strangled by waste pieces of floss (although I’m not sure how likely this is to happen if you dispose of it properly in a bin). You might also want to find a zero waste alternative if you’ve given up your waste bin and have no wish to hang on to pieces of used floss in a jar. Or maybe zero wasters are just perfectionists. Dental Lace, comes in refillable capsules containing silk floss coated in vegetable-based wax. The packaging is designed to look good if you are carrying it with you. For vegans, EcoDent do standard floss in cardboard packaging, which can at least be recycled. Otherwise, if sourcing zero waste floss seems like too much hassle, don’t worry. It’s just dental floss. How is ‘disposing of properly in a bin’ going to prevent dental floss from going to landfill? The point is surely to not use it in the first place. Tooth cleaning options are really plentiful… There are loads of suggestions online. And whilst bicarb may be abrasive, you don’t need much and there are other natural ingredients and oils you can mix with it to get a clean mouth and teeth, rather than just buying a tube of toothpaste. Just feel you haven’t lived up to your name with this article… “The zero waster”?